These amazing teams – including the Effingham County Lightning, coached by Susan and Phil Zakutansky; the Mattoon Middle School, coached by Crystal Sparks; and the Mattoon/ Charleston Hornets, coached by Brad Duncan and Erin Siekmann – brought exciting competition and heart to the court, as family and fans of the athletes cheered on their favorite team. 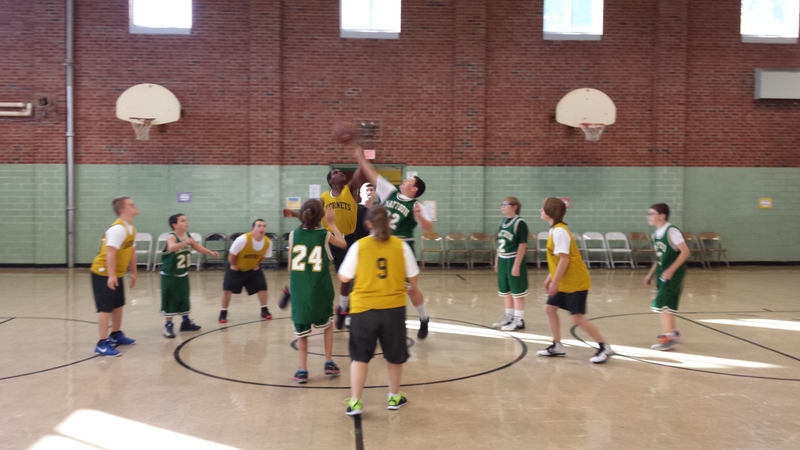 In the first game of the day (tip-off shown in photo at top), the Mattoon Middle School, a team consisting of athletes ages 11-14, bravely took on the Mattoon/Charleston Hornets, a high school and young adult team, in a match that ended 32-16 for the Hornets. The beaten, but not defeated Mattoon Middle School team went on to play the Effingham County Lightning team, another high school & young adult team, in the closest match of the day. Coach Sparks motivated her young team to continue to play with pride and determination, despite the overwhelming height disadvantage of her players. With that said, the Mattoon Middle School was not able to defeat the experienced and taller Effingham County Lightning in a game ending with a 24-17 score. Finally, in the last game of the day, the Mattoon/Charleston Hornets met the Effingham County Lightning on the court. Inspiring sportsmanship and awesome basketball skills were displayed by both teams, but in the end, the Mattoon/Charleston Hornets beat out the Lightning 35-25. If you missed the first games of the season between these three outstanding Area 9 basketball teams, you are welcome to come cheer them on for the round robin competition that will be held Sunday, Nov. 22, at the Effingham Park District. A similar round robin game schedule will be maintained for this basketball competition, which starts at 1 p.m.
Area 9 basketball teams will be competing in several tournament and round robin competitions throughout the season, until the District Championships on Jan. 31 in Trenton. 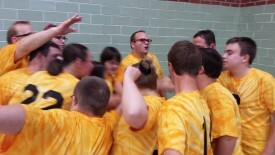 Teams that win gold at the District Basketball Tournament are then eligible to attend the Special Olympics Illinois State Basketball Tournament March 11-13, 2016, in Normal.